Or: using multiples of 71 for fun and profit. Why 71? Well, you know how a standard US 12-oz bottle is 355 mls, which is 5×71, whereas an imperial pint is 568 mls or 8×71? Well, you do now. And you know how 14 71s is 994, meaning that an imperial pint is near as dammit 8/14s or 4/7s of a litre? Well, thank me later. You can probably see where I’m going with this. To use, pick one row – or column – and memorise it; you can derive all the rest from it. Either that or print it out. UPDATE Removed the ‘US Pint’ entries and added ‘2/3’, that being a measure people reading this are actually likely to see. Dry January was never really going to be an option for me, if only because I invariably over-purchase before Christmas. If you can abstain for a month with a sizeable stash of weird and expensive stuff looking you in the eye every time you go for the hoover, you’re a better man than I am, Gunga Din. Last weekend I finally drank the last of this year’s pre-Christmas purchases; since this left my beer stocks looking dangerously low (1 x each of Duvel, Old Tom, McEwan’s Champion) I also did a bit of re-stocking. So here, without much comment, are two shopping lists. Bit spendy, really. Was it worth it? Well, the first five – everything down to the Portent of Usher – struck me as rock-solid stone-cold five-star classics, and the next three after that were pretty damn good. I won’t go through the last five, except to say that with my beer-judging hat on I’d rate them all as good to very good. There certainly weren’t any stinkers – but a couple of them, for me, would qualify as fairly expensive experiments. I agonised over that Adnams bitter – it was that or a Proper Job – but in the end the idea of filling my bottle carrier with three old-school bitters and three pales appealed to me. So far I’ve had the Oxford Gold, which I’m planning on writing about separately; my mouth is actually watering at the thought of the Harbour IPA, and for that matter the dear old Landlord. All that for two notes for the best part of a pint. On the other hand, I did really enjoy that Portent, which set me back £4.50 for 330 ml. But was it three and a half times as good as Landlord? Yeah… no… maybe. What’s the point here? Just to say that the market is segmenting, and that the prices on the ‘craft’ side of the street really are rather high, when you stop to think about it. On the other hand, having a segmented marketplace doesn’t necessarily mean that beer drinkers have to commit to one segment and no other, or even that brewers have to – although sticking to one market segment would save you the bother of managing multiple different price ranges, which would have to be a challenge. Playing both sides may even become a necessity. There may not always be enough people willing to pay the equivalent of £7-8 a pint for an unknown style from an unknown brewery (or collab); equally, there may not always be enough people willing to pay even a couple of quid for yet another familiar bitter from yet another mid-table brewery. Sadly, beer owes nobody a living. …and with that gloomy thought I approach the end of Dry Tuesday (would have been Monday but my wife opened some wine). Twenty-four hours, no problem! Not going to stretch it to 48, though – there’s a Meet the Brewer with Ticketybrew at the Ford Madox Brown tomorrow night. More on that in due course. A North American observer will be struck by what seem uniformly low ABV in the blackboard menu [which advertised beers ranging from 3.6% to 4%]. Curious if you ran into any beers of 5% or more. I don’t know about you, but when I order a pint it’s not because I think twenty fluid ounces (imperial) is just the right amount – eighteen wouldn’t hit the spot, twenty-two would be excessive… I order beer in pints because that’s what you do: “a beer”, if you’re an adult male, will almost invariably mean “a pint of beer”. (My OH and I used to talk about going for “a swift half”; even then I’d order pints.) So, when I think of three or four beers I’m thinking of three or four pints – and when I think of a session beer, I’m thinking of a beer I could drink three or four pints of without regretting it, which realistically means nothing very much over 4%. What that table tells you is what you get, relative to an imperial pint, in a given ABV at 16 or 12 US fluid ounces: so a 4.8% beer is the 16-oz equivalent of a pint at 4%, or the 12-oz equivalent of a pint at 3%. See where I’m going? If your idea of a ‘session beer’ is one that leaves you comfortably merry, but not downright palatic, after four beers – and if your idea of “a beer” is 5/8 of an imperial pint – then a 4% beer is going to be no good to you at all: you’ll want a 6.4% beer to get the same effect as an imperial pint at 4%. Even if 16-oz measures are standard (see comments), you’ll be looking for 4.8% minimum. Just on the basis of a 16-ounce glass, we’d expect US ‘session beers’ to range between 4.2% and 5.4%, for exactly the same reason that British session beers generally range between 3.5% and 4.5%. And we’d expect US brewers to have little or no interest in anything below 3.6%, for exactly the same reason that British brewers don’t tend to do much below 3%. On the other hand, we’d expect US beer drinkers to treat beer strengths up to 8% as perfectly normal, for exactly the same reason that British drinkers are happy going up to 6-6.5% (e.g. Wobby Bob, Elland Porter). Then again, on the basis of a twelve-ounce glass (bottle; bottle, glass) you’d expect session beers between 5% and 7%, a ‘floor’ of 4.8% and a ‘ceiling’ of 10% – which not only makes a better story but seems more in line with complaints about ABV-crazy brewing, misunderstandings of ‘session beer’, etc, etc. Perhaps bottle sizes are more influential than glass sizes. Or perhaps it’s not all in the glassware! In comments: a recent visitor to the US necessitates extensive modification to the original version of this theory by revealing that 16 oz glassware is in fact standard. Cheers, Ron! The usual narrative is that US soldiers stationed in the UK during the war found our beer “warm” because they compared it to what they were used to back home. However given that many of them would be stationed in the country and visited rural pubs, it seems that the beer really would have been warm – especially those that stored the beer in the way described here and the moved it inside to be served on gravity, as I suspect many of them would have done at the time. What we don’t see is any reference to drinkers finding cask beer to be warm in the glass. This rapidly changes from 1941 onwards; there’s a steep climb on the Ngram Viewer’s chart, peaking in 1945. The frequency then drops back down, to settle at a higher level in the early 50s. It’s in 1941 that Google Books finds its first reference to ‘warm beer’ being the norm in Britain – and there’s only one in the whole year. In 1942 – with the arrival of GIs in Britain – the floodgates open. From 1942 to 1946 the references to warm beer are legion; it’s often mentioned together with tea, as typical features of the English landscape which American newcomers found baffling. Warm beer in this sense is referred to just as often as warm beer from bottles. Interestingly, a lot of these references are also from the point of view of soldiers on active service. Perhaps from a GI’s point of view there wasn’t much to choose between beer that had been kept in a hole in the ground in North Africa and beer from a quaint old English hand pump – they both met the same lowered expectations. As I said above, the Ngram Viewer shows a lower frequency of references after the war; Google Books also goes a bit quiet. This surprised me – I was expecting George Orwell’s famous reference to warm beer to have had more of an impact. (More on that later.) The ‘warm English beer’ trope may have got going when the GIs came, but when they left it seems to have stopped again – or at least become dormant; after 1946 we’re back to the warm bottles and problems with inadequately chilled lines. It’s worth emphasising that this idea of warm beer as a problem, from the server’s point of view, is not at all the same thing as the idea of ‘warm beer’ being the norm. If anything it’s the opposite, as they show that English bar staff in the 1950s and 60s were worrying about their beer occasionally being too warm – just as they had done in the 1930s. In about 1973 the Ngram chart line starts to climb again; it climbs and climbs until it plateaus at the start of the 90s. This may be partly in response to the rise of kegging, which by then was becoming ubiquitous; some sentimental souls may have seen warm beer as part of an England we had lost. My trawl in Google Books didn’t turn up any evidence to support this, however. What I did find was an association between ‘warm beer’ and another 1970s development: CAMRA, and the broader movement towards taking English beer styles seriously. Ironically, the ‘warm beer’ trope seems to have been given a boost by several people – not all of them called Protz – complaining about it, and pointing out painstakingly that cellar-temperature cask beer is not what anyone from south of the Arctic Circle would call ‘warm’. Fifty years from now Britain will still be the country of long shadows on county grounds, warm beer, invincible green suburbs, dog lovers and pools fillers and – as George Orwell said – “old maids bicycling to Holy Communion through the morning mist” and if we get our way – Shakespeare still read even in school. Britain will survive unamendable in all essentials. Surely we trust our own integrity as a people quite enough to fear nothing in Europe. We are the British, a people freely living inside a Europe which is glad to see us and wants us. After 20 years we have come of age in Europe. One Conservative leader put us there. This Conservative leader means us to thrive there. So let’s get on with it. When you come back to England from any foreign country, you have immediately the sensation of breathing a different air. Even in the first few minutes dozens of small things conspire to give you this feeling. The beer is bitterer, the coins are heavier, the grass is greener, the advertisements are more blatant. The crowds in the big towns, with their mild knobby faces, their bad teeth and gentle manners, are different from a European crowd. Then the vastness of England swallows you up, and you lose for a while your feeling that the whole nation has a single identifiable character. Are there really such things as nations? Are we not forty-six million individuals, all different? And the diversity of it, the chaos! The clatter of clogs in the Lancashire mill towns, the to-and-fro of the lorries on the Great North Road, the queues outside the Labour Exchanges, the rattle of pin-tables in the Soho pubs, the old maids biking to Holy Communion through the mists of the autumn morning – all these are not only fragments, but characteristic fragments, of the English scene. How can one make a pattern out of this muddle? But talk to foreigners, read foreign books or newspapers, and you are brought back to the same thought. Yes, there is something distinctive and recognizable in English civilization. It is a culture as individual as that of Spain. It is somehow bound up with solid breakfasts and gloomy Sundays, smoky towns and winding roads, green fields and red pillar-boxes. It has a flavour of its own. Moreover it is continuous, it stretches into the future and the past, there is something in it that persists, as in a living creature. What can the England of 1940 have in common with the England of 1840? But then, what have you in common with the child of five whose photograph your mother keeps on the mantelpiece? Nothing, except that you happen to be the same person. As for the contemporary fortunes of the ‘warm beer’ trope, I’d like to be able to report that the phrase became a stock signifier of Englishness (or possibly Britishness) straight after Major’s speech. I’d like to, but both Google Books and the Ngram Viewer are telling me otherwise. The phrase climbs in frequency very gently between 1992 and 1996, then climbs much more steeply over the next eight years; it peaks in 2004 and then declines gently until 2008 (the Ngram Viewer’s cut-off point). Similarly, Google Books shows very little action for the rest of the 90s; there are at least as many references to beer recipes and to unpleasantly warm cans and bottles (generally in hot countries) as there are to the proverbial Britishness of warm beer. Something certainly happened to give the phrase more prominence some time in the late 1990s, but exactly what it was – and when it happened – is unclear. Interestingly, if we put other phrases from Major’s speech into the Ngram Viewer – phrases like ‘pools fillers’ and ‘old maids cycling’ (Orwell wrote ‘biking’) – we see a similar pattern: a rapid rise after 1994, a peak between 2000 and 2004, then decline. Perhaps it simply took time for Major’s imagery to work its way into print (a book called “Invincible Green Suburbs” was published in 1998). Perhaps it has something to do with ‘Cool Britannia’ (1997-8) – and in particular Tony Blair’s eagerness to jump that wave when he became Prime Minister in the middle of it; perhaps the TV programme “I Love 1993” (broadcast in September 2001) would be worth checking out. John Major didn’t invent the image of warm cask beer. It had been knocking around the national consciousness ever since 1942; thirty years after that, the image had been given greater salience both by the rise of keg and, paradoxically, by the efforts of cask devotees to debunk it. (You can’t say “it’s not true that cask beer is served warm” without saying the words “cask beer is served warm”!) But the prominence that the image has enjoyed recently is just that, recent. Before Major (and before Cool Britannia), “warm cask beer” was a sneer and a debating point. It took a controversial speech by an unpopular Prime Minister to turn it into a popular image of a British tradition. Like many imagined traditions, this one is barely old enough to drink. Update (8th March) This conclusion needs a bit of qualification. As commenters have pointed out, ‘warm beer’ jokes abound in Goscinny & Uderzo’s Astérix chez les Bretons – written in 1965 and translated as Asterix in Britain in 1970. Further Googling for the phrase “as British as warm beer” finds multiple occurrences in the late 1990s and after – as we’d expect – but also one from 1986 and one from 1965; unlike those in the Asterix book, these don’t appear to have been written by outsiders looking in. So perhaps the ‘warm beer’ trope had a bit more of a hold before 1993 than I gave it credit for. I’d still maintain that Major’s speech gave it, at the very least, a big push towards the prominence it now has. We’ve been here before. Four Loko is, basically, loopy-juice; it’s made with malt liquor in the US and with grain alcohol in Europe, with a variety of flavours (all of them sweet), and sold at strengths of 6%, 8% and most commonly 12%. One other thing: it’s sold in cans, of 23.5 US fluid ounces – just under two standard 12-oz bottles, in other words, or 695 ml. That’s an awful lot of alcohol, in readily-neckable form. And those four (original) ingredients? One of them is alcohol (which at least has the virtue of frankness). Another is taurine, the substance which gave Red Bull its name and whose properties, despite a huge multi-year natural experiment in adding it to soft drinks, remain unclear. The other two are caffeine and guarana, which – whatever else of an exotic and rain-forest-y variety might be in it – is a natural source of caffeine. So, effectively, it was Two Loko: alcohol and caffeine. It’s a powerful combination, and works in (let’s be honest) an enjoyable way; when I was younger and had fewer responsibilities I once spent an entire day going from bar to bar in Barcelona, alternating wine and espresso. (I didn’t have a lot to do the next day.) But neither alcohol nor caffeine is actually good for you in large quantities; the combination, by keeping you alert for longer, makes it easy to drink potentially harmful amounts of alcohol, while simultaneously making it easy to drink potentially harmful amounts of caffeine. Mixing alcohol and caffeine in large quantities (such as 695 ml – just under a pint and a quarter) and at high alcohol concentrations (such as 12%), is basically a bad idea. Put it another way: if you drink a can of old-style Four Loko you’ve basically just drunk 2/3 of a bottle of Buckie (“the UK’s version of Four Loko”, confirms Vice magazine). Jacob Sullum of the right-Libertarian Reason magazine has tried to defend Four Loko on two occasions, on general “keep the government out of my business” grounds, but it’s a tough pitch. The best he could come up with was to point out that making the cans resealable (to reduce the temptation to neck the entire can) wouldn’t actually stop anyone necking the entire can if they wanted to (true, but so what? ); that coffee is used in some cocktails (which aren’t usually served in glasses holding 695 ml); and (my favourite) that “A can of Four Loko contains less alcohol … than some big bottles of craft beer.” A can of Four Loko contains 83.4 mls of alcohol; for an Imperial pint to deliver that much alcohol it would need to be 14.7%. Those are some big bottles of craft beer. Anyway, a couple of years ago and in the wake of some horribly predictable and happily only near-fatal excess consumption incidents, the powers that be in the US decided (to Reason‘s chagrin) that the whole alcohol/caffeine thing was bad news, and Four Loko was reformulated to contain alcohol and, er, that’s it. So that’s One Loko, then – only not Loko in the sense of… er… can we get back to you on this? Which is where we came in: with Phusion Projects gamely trying to push their 12%-by-volume grain-alcohol-and-Starburst three-pints-of-lager-inna-can confection in the UK, and our old mates at Portman gravely ticking them off for being so irresponsible as to suggest that getting drunk might be enjoyable in some way. As I said at the top, if only they could both lose! Apparently most cask beers at IMBC worked out at three tokens per pint, while the keg beers were (mostly?) six tokens per pint or more. With tokens available at 11 for £10, the cask was pretty reasonable but that keg was expensive stuff. I agree, pricing was high for some beers. I guess I just expected that though. Plus I’m willing to pay higher prices for the opportunity given: so many interesting, unique, and hard-to-find beers in one place on draught! Stunning! Evidently not to some people. But I think it’s a road beer-lovers should be very wary of going down, or encouraging brewers to go down. Look at it this way. The drinking-age (over-17) population of the UK is just under 50,000,000. Ten million of those are over 64, so presumably living on a pension. Some pensioners seem to do OK, but it’s not a wild generalisation to say that people in this group tend not to have money to burn. That leaves 40 million – 80% of the total – of working and drinking age. 70% of those 40,000,000 are in fact working – the remainder are classed either as unemployed or as economically inactive (we can go into the difference between those another time if anyone’s intrigued). Now, median annual earnings across the working population – the level that splits the working population in two, with as many people above the line as below it – are about £21,000. After that the income graph slopes upward quite slowly; the 75th centile, the point at which you leave three-quarters of the working population behind, is somewhere around £33,000. So, out of 50 million people who either drink beer or could do so without breaking the law, ten million are on pensions; twelve million are of earning age but not actually earning, because they’re on benefits or being supported by somebody else; and fourteen million, half of the remainder, are in work but earning less than 21k. Anyone earning 33k or more is in the top 25% of the working population – which itself is not much more than half of the total drinking-age population. I’m not suggesting here that people on low incomes can’t afford expensive beer – you could use very similar logic to say that they can’t afford beer full stop, and you could argue that if you can only afford one beer a week you might as well make it a good one. The point is that people on low incomes are much more likely to be put off by high prices – and people on low incomes are actually the large majority of the population. Saying “of course the prices are high, what would you expect” amounts to telling seven out of eight drinkers that they’re not wanted. So, farewell then, Mild Magic 2012. Since the 14th of April I’ve drunk – or at least asked for – mild in 49 different pubs, almost all of which had someone behind the bar who knew all about MM. Now, does anyone know what I can do with four pints’ worth of mild tokens for the Stockport Beer and Cider Festival? (Other than going to the Festival and drinking mild all day, that is.) Perhaps another time the prize could be Anything But Mild tokens – it’s just a thought. The experience of Mild Magic should have given us all such a taste for the stuff that we could be relied on to spend our own money on it, after all. A few weeks ago in New York a group of college students gathered at a vigil. They sang songs, and held candles as they mourned the passing of a friend. The scene can be seen on YouTube. What makes it slightly surreal is that the gathered crowd is lamenting the demise of an alcoholic drink, Four Loko. From Monday, Four Loko will no longer exist in its original incarnation – as a mix of alcohol and caffeine in a can – on the orders of the US Food and Drug Administration (FDA). one 23.5oz (694ml) can contains as much caffeine as a tall Starbucks coffee. It is a combination those who drink it say tastes great and makes you feel good. But others describe it as a “blackout in a can”, and blame it for landing a number of students in hospital. Apparently not: it seems there are genuine health concerns. Last month, the US Food and Drug Administration called on the top four manufacturers to take them out of circulation by 13 December. Dr Joshua M Sharfstein, the FDA’s principal deputy commissioner, said evidence suggested that the mix of caffeine and alcohol posed a “public health concern”. Four Loko will continue to be on sale, but now without the caffeine. Four Loko is available in eight flavors: Uva Berry (Grape), Fruit Punch, Orange Blend, Watermelon, Blue Raspberry, Lemon Lime, Lemonade, and Cranberry Lemonade. James has tried Four Loko and Joose and isn’t a huge fan. He says most people who drank it on campus were “inexperienced drinkers” who saw it, at around $1.50, as an inexpensive way to get drunk. So, to recap, the jokers behind Four Loko were selling a fruit-flavoured drink containing almost as much alcohol in one can as a litre of Special Brew, at $1.50 a throw, in a country where under-21s can’t buy alcohol. What was that, James? But, as we’ve seen, the FDA has sprung into action, removing Four Loko from sale. And it’s not just the bottle-of-Buckie-inna-can merchants that the FDA have gone after. (Buckfast also contains caffeine, incidentally; presumably they don’t export.) New Century Brewing’s Moonshot ’69 has also got the cease-and-desist treatment. A 5% beer (without any fruit flavourings) brewed by a one-woman company, Moonshot doesn’t share a lot with Four Loko, but what they do have in common is caffeine: the FDA are getting involved because “caffeine was put directly in the [beer] as a food additive and was not naturally occurring, as it would be in a beer brewed with coffee”. Well, you can’t be too careful. But at least Four Loko is off the shelves. Or rather, it was, for as long as it took them to take out the caffeine – which wasn’t very long. So kids who have reached the age of 21 thinking of alcohol as a forbidden pleasure can once more enjoy the freedom to get wrecked, for a couple of dollars, on a drink that comes in eight refreshing fruit flavours. What this story says to me is that abstinence and over-indulgence are two sides of the same coin. Each one feeds off the other, and neither of them represents a psychologically healthy attitude to booze. Where alcohol is concerned, “little and often” has to be the best policy – for the mind as well as the body. Cask ale sales aren’t rising, they’re holding steady. They’re holding steady at a low level, having dropped by 30% since 1999. If cask appears to be gaining market share, this is the result of cask sales holding steady while overall beer sales fall. This fall in overall beer sales is an established trend, but a new and worrying one. It is not clear whether cask is actually immune to this trend, or if its effects are being cancelled out by a separate rise in cask drinking. The fact that cask ale drinking rose in the South-East of England in 2009, while falling in the rest of the country, lends some support to the ‘separate rise’ theory. In the early 1970s, interest in real ale was almost an archaeological exercise. It was a declining product, produced by old-fashioned, stick-in-the-mud breweries, sold in grotty backstreet boozers and drunk by middle-aged and elderly working men. … In the early days of CAMRA, many of its supporters felt that they were just marking the passing of an era, in the same way as steam locomotive buffs were. Possibly in the future there might be the occasional brewpub producing real ale on a cottage scale, a bit like a preserved steam railway, but no more than that. However, it didn’t work out like that. … the nature of the relationship between producer and consumer has fundamentally changed, and is far more interactive. Brewers and pub operators are far more aware of what their customers want, and responsive to their requirements. It is a very big change from basically exploring a static or declining field of interest. It is almost as if the National Trust, aware of a wide and growing interest in stately homes, had suddenly decided to start building new ones. cask ale drinkers tend to agree with statements that are more thoughtful, inquisitive and curious. They are active in their leisure time, interested in what goes on in the world, and like to stay informed about everything from international events to developments in technology. This attitude is also reflected in the fact that they read a lot of newspapers. They’re twice as likely to read quality dailies like the Guardian, Telegraph and Independent, but more likely to read any newspaper overall apart from the Star, Sun and in Scotland the Daily Record. 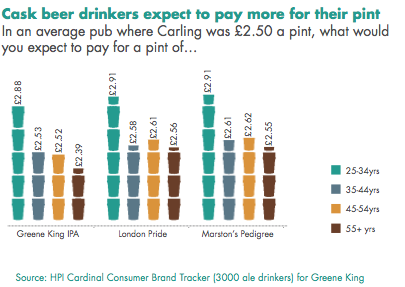 Cask ale drinkers tend to be upmarket (68.5% are social grade ABC1). They are more comfortable about their financial situation, and tend to be at a life stage with fewer financial commitments. They tend to wear cravats and sit at the bar talking in loud braying voices, before driving home in their red MGs which were actually a bloody good investment when you really look at it. All this is partly smoke and mirrors: according to the 2001 Census (with some post-processing), 55% of the working-age population falls into either the AB group (professional and managerial) or C1 (supervisory and clerical). There’s a difference between a 55/45 split and 68.5/31.5, but not a huge one (Fisher’s exact test gives a p value of 0.08, stats geeks). All this statistic is really saying is that a random sample of cask ale drinkers is a bit more likely to include white-collar workers than a random sample of the population as a whole. Nevertheless, the trend of the argument is clear: put on more cask ale and you’ll attract responsible drinkers who like good quality wine and read quality dailies. Nice people, in short – well, middle-class people, anyway. You know that old bloke who used to be in there every time you went in, sat in the corner with a fag on and an everlasting pint of Tetley’s and the Daily Mirror, and on Friday lunch his son would come in and they’d have lunch together? Not people like him. One of the absurdities of cask ale is that, as the most crafted, quality drink on the bar, it is often the cheapest. If we compare premium sausages to mass-produced mechanically recovered meat sausages, farmhouse cheese to processed cheese, real coffee to freeze-dried granules, we routinely expect the premium version to cost more. The fact that cask is cheaper is doubly absurd because cask drinkers actually expect and are prepared to pay more for cask beer – especially the younger drinkers the category is so keen to recruit. OK, let’s break this down. First point: the statistics don’t say what the Report says they do. They specifically don’t say what drinkers are prepared to pay for cask beer, just what they’d expect to be charged. Moreover, the averaged-out figures for all the over-34 age-groups don’t show much difference from the £2.50 baseline, ranging from £2.62 down to £2.39; the fact that they aren’t any lower probably just reflects a general awareness that £2.50 is pretty cheap for a pint these days. 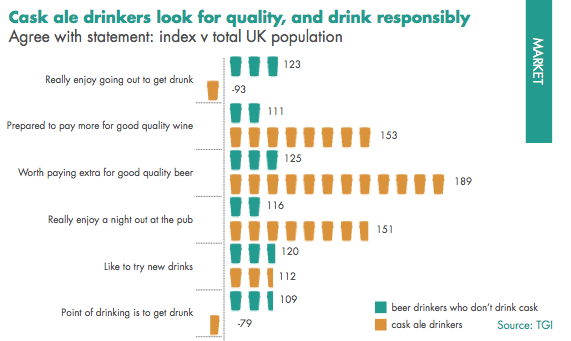 The only striking result is in the under-35 age group – the younger drinkers the category is so keen to recruit, or in other words people who haven’t got much experience of drinking cask ale. Second point: there’s a reason why cask ale is generally cheaper than the alternatives, and it’s historical. When keg bitter was introduced it was new, different and modern; it had an instant superficial appeal (why, every pint tastes the same! and they’re all fizzy! ); and it did well. The breweries took the opportunity to jack up the price, even though the beer was actually cheaper to produce and distribute. When the big push on lager came in the 1970s, the same thing happened: your Hofmeister and your Heineken were new and exotic, so naturally they were priced even higher. Same story with nitrokeg Guinness. In short, there’s a reason why cask ale is generally cheaper than the alternatives, and the reason is that keg drinkers are being ripped off. Since the rip-off has been going on for literally four decades, it’s probably not going to end any time soon – but to see it used as a reason for ripping off cask drinkers as well is a remarkable bit of chutzpah. Fundamental point: cask beer is not a “premium” product. Ground coffee is not a premium version of instant coffee, it’s the real thing: instant coffee is a cheap substitute for ground coffee. (I drink it all the time, but (with all due respect to Rula Lenska) you would never imagine you were drinking ground coffee.) Sausages made from recognisable cuts of meat aren’t a premium version of mass-produced mechanically recovered meat sausages, they’re the real thing; the nameless-pink-slurry variety are a cheap substitute. What Pete appears to be suggesting here is that lager and keg bitter are cheap, mechanically-produced substitutes for hand-crafted real beer. It’s a point of view that had a lot of currency in CAMRA in the early days, but I understood the debate had moved on a bit. What’s going on here is, essentially, rhetorical softening-up for introducing the idea of ‘premium’ beer; on the back of bracketing real ale with foods that aren’t cheap and nasty, we’re being asked to bracket it with semi-luxury goods like farmhouse cheese. Like some other bloggers, I like a nice bit of cheese, and I’ll buy the odd bit of Stilton or chèvre without counting the cost too carefully. But when I go to the pub on a Saturday, I do not want to order the beer equivalent of an artisanal Brie. There’s good beer and then there’s New Special Different Original Rare Short-Run Hand-Finished Beer – or novelty beer for short – and never the twain shall meet. I will buy novelty beer from time to time – I’ve got all four of the recent Marble bottlings, each waiting for its own special occasion – but it really isn’t what I want to find on the bar on the average Saturday. In the previous post I commented on the Report’s use of statistics, as well as the detail of the conclusions it draws from them, and concluded that it’s at least as much a piece of advocacy as an analytical report. I also asked: “if it is trying to influence people, what goal does it have in mind – and is that a goal I share?” My ideal world, as far as beer is concerned, is one in which the decline of cask is reversed: a world where I could go into any pub in town – including the ones where people read the Daily Mirror; including the ones where people drink Vod-Bull, come to that – and find at least one hand-pump on the bar dispensing a beer that’s in good condition, because people have been drinking it. I’m lucky; good, interesting, relatively inexpensive cask beer is part of my everyday life (well, 2-3 times a week rather than everyday as such, but the point stands). My ideal world is one where many, many more people have that experience. I’m really not sure that that’s the ideal world the Cask Report is envisaging. Rather, I can see a vista of high-priced ‘premium’ and novelty beers opening up, with a new class of beer-drinkers to go with them: ABC1, Guardian and Telegraph-readers, responsible drinkers, comfortable with their financial situation, willing to pay for quality, and so on and so forth. And, perhaps, living mainly in the South-East. The really worrying thought is that the Cask Report may genuinely be reporting the future of cask: perhaps the shift towards “premiumisation”, the prominence of broadsheet readers and the anomalous rise in cask volumes in the South-East are all part of the same trend. Perhaps what’s continuing to decline in most of the country is the world of the pub and club as we’ve known it, and what’s on the rise in the South-East is a new kind of cask drinker: people who are already used to the £3 pint, and can pay more than that without really noticing; people who, as Gazza suggested, come to single-varietal beers knowing all about “the characteristics of individual grapes used in wine production”; people who genuinely see cask beer as a ‘premium’ product, in short, and don’t mind paying a premium for it. These are not my kind of beer drinker – and I’m not convinced their beer is going to be my kind of beer. I’ve been browsing the Cask Report. It’s well-written and well-presented, and will probably do more to help the spread of real ale than any number of well-meaning but patronising columns aimed at the punters (here’s one I read earlier). So I apologise in advance to Pete if my comments seem unduly negative. I had two big problems with the Report. Firstly, what is it – is it an analytical report on recent trends in the cask beer market (as the name implies) or is it an elaborate piece of advocacy, a public information message from the Cask Marketing Board? (They’re happy, because they drink cask!) The problem here is that the two types of document would approach the evidence in very different ways: a marketing ‘report’ might skate over results that an analytical report would highlight, while putting a lot of weight on findings that can’t necessarily bear it. And secondly, if it is trying to influence people, what goal does it have in mind – and is that a goal I share? It’s much clearer from that graph that we’re looking at the back end of a long period of decline. Two periods, to be precise: from 1999 to 2006 overall beer volumes held more or less steady, ranging from 97% of the 1999 volume to 102%. 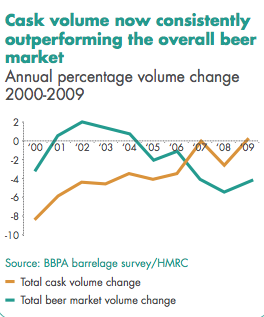 Meanwhile, cask volumes declined steeply and steadily: 92% of the 1999 figure in 2000, 83% in 2002, 73.6% in 2005. (The fact that this downward curve gets shallower as it goes on is what creates that upward line in the published graph.) From 2006 to 2009 the trends were reversed, with overall volumes dropping year by year while cask volumes held more or less steady – but at a level far, far below the level of 1999, which was scarcely the Roaring Twenties in the first place. One clue is provided by this graphic, which I found both informative and infuriating. The point, anyway, is that the North-East (for example) is a big cask-drinking region while Scotland isn’t, so the 6.6% decline registered in the North-East for 2009 almost exactly cancels out that seemingly huge 31% rise. Which still leaves substantial drops in just about every other part of England and Wales to account for. (We know in this instance that the UK’s total cask ale consumption hasn’t changed, so a fall in one area has to be matched by a rise in another.) The answer lies in the South-East – although oddly enough not in London itself – where a 7.5% year-on-year rise in cask consumption was sufficient to offset declining sales in four other regions. This lends some support to the speculation that downward pressures on beer consumption may be being cancelled out by a separate rising trend – a geographically separate trend, apparently.